(CNSNews.com) -Of the 3,977,745 babies born in the United States of America in 2015, 1,600,208 of them—or 40.2 percent--were born to unmarried mothers, according to data released this month by the Center for Disease Control and Prevention. In the years since 1940, according historical data published by the CDC, the percentage of babies born to unmarried women never went as high as 40 percent until 2008, when it hit 40.6 percent. 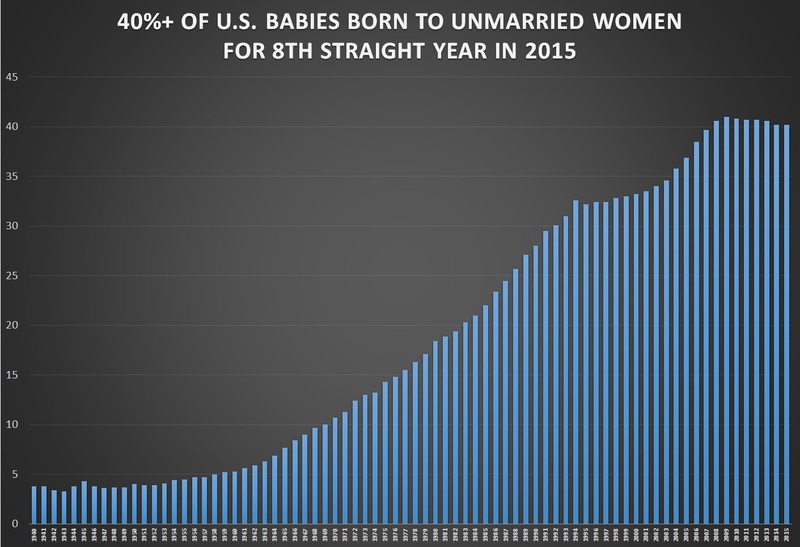 In 2008, 40.6 percent of the babies born in the United States were born to unmarried women. In 2009, it was 41.0 percent. In 2010, it was 40.8 percent. In 2011, it was 40.7 percent. In 2012, it was 40.7 percent. In 2013, it was 40.6 percent. In 2014, it was 40.2 percent. And, in 2015, it was 40.2 percent. In its report on the preliminary birth data for 2015, which was released on June 2, the CDC noted that the number of births per 1,000 women in the 15 to 44 age range declined last year as did the actual number of babies born to unmarried women. “The preliminary birth rate for unmarried women in 2015 was 43.5 births per 1,000 unmarried women aged 15-44, down 1 percent from 2014 (43.9) and marking the seventh consecutive year of decline since the all-time peak in 2007 and 2008 (51.8),” said the report. “The percentage of all births to unmarried women was 40.2 percent in 2015, unchanged from 2014,” said the report.